You just never know for sure. That, for me, is one of the compelling things about landscape photography. You just never know when you head out if today will be the day when the chasing of the light pays off. Many times it doesn't quite. It nearly gets there, but the light just fails to deliver at the last moment. The day can seem so promising when you head out; but, when it comes to deliver, the light goes and you're left with nothing much to show for your troubles. But sometimes, the light and the location all come together in a perfect convergence (right place at the right time, in common parlance), and the efforts are rewarded. (Fortunately, these happy circumstances happen just enough times to keep us going back for more). And then sometimes, just sometimes, you are rewarded not just with a shot that puts a smile on your face, but with the shot of a life time. The kind of shot that you just know when you're taking it is going to be something a bit special. My aurora shots of 30 October 2013 were an occasion like this. 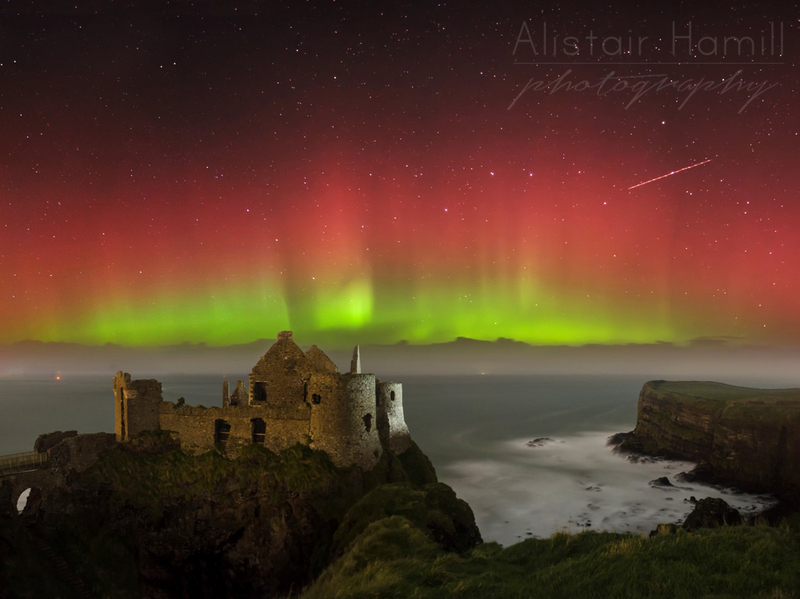 I had first come to realise that you could even hope to capture a shot like this in Ireland around Easter 2012. And since then, like many, I had hoped some day that I would be fortunate enough to capture the Northern Lights. And so began a year long quest. My first serious attempt was in October 2012 at a weekend in Whitepark Bay Youth Hostel. I'd heard an aurora watch was in force and went out on a bitterly cold, clear night, only to capture the faintest of green smudges on the horizon. Not much to look at, but a tantalising glimpse of the aurora nonetheless. And enough to give me a taste for it! So I kept my eye on the forecast over the coming months. Forecasting the aurora appears to be a very difficult thing. There is very little certainty about whether or not it will make an appearance. So, although a few times I was tempted to venture northwards, the prospects of an hour's drive north only to discover that there was nothing more than another faint green smudge were never enough to tempt me to the coast. But October 2013 saw us up north for a week. And the aurora sites were hinting that there might be something of a show during the week. The forecast was typical Northern Irish showers - so, even if there was a display, would the weather co-operate and give us a view? Nevertheless, I lived in hope. I was in the right place. But would it be the right time? On the Tuesday night there was a bit of chatter on aurora watch. So out I ventured to one of my favourite night time locations at Dunluce Castle. It was cloudy, but with just the odd gap towards the horizon, I set up and shot anyway. But I got nothing much. Perhaps just the faintest hint of green, but that was about it. Maybe this week would be another that promised but didn't deliver. On the Wednesday night, we were sitting in McDonald's in Coleraine, after enjoying Thor in the last afternoon showing in the cinema. While the kids finished their meals, I checked the aurora website again. Some folks were posting shots of green skies in Scotland. Quite nonchalantly, I asked my wife if she fancied heading out to Dunluce on the way home, just to see if anything was on view. 'Okay,' she replied, equally nonchalantly. It turns out it was far more significant a conversation than either of us could have realised at the time. We arrived at the Castle at around 9.00pm. got wrapped up warm and headed to a vantage point. I could already tell that tonight was better than last night. The sky was clearer, jusst a band of cloud low along the horizon, and I could just pick out the faint green glow above it (my wife couldn't see anything with the naked eye). One 20 second exposure later, and she could see it alright. This was already much better than the shot I'd got last October, and I was very happy with our decision. But, even at that stage, we still had no idea just what lay in store. For after we'd been there for about 15 minutes, all of a sudden the light show went into overdrive. What started as a barely visible green glow, suddenly and dramatically sprung into life. Shafts of light sprung upwards from behind the clouds, as if someone had turned on a series of powerful WW2 spotlights behind the cloud bank. The colours intensified, the lights danced around the sky, and we were treated to the most awe inspiring and stunning light shows I have ever seen. I was like a child in a candy store, brimming with excitement almost unable to believe the display before us. So I shot away, photo after photo, desperate to capture this moment, while being drawn so deeply into it at the same time. At one point, an air liner passed overhead. I wonder if the captain told the passengers to glance out of the right hand side of the plane to enjoy the view. By 9.30, the display had begun to fade and, although the faint green band remained for most of the rest of the night, the light spikes were done after 15 minutes of the most spectacular show. It took a year of watching and waiting. And if we hadn't have made it for that 15 minute window, I'd be left sitting looking at others' shots of this show, wishing that the next time it could be me.